My N.D. recommended Emotional Wellness. I definitely feel a difference. My overall emotional wellbeing seems improved and more balanced. I take these along with a healthy diet regular exercise and additional vitamin and herbal support. GABA (gamma-aminobutyric acid) is an inhibitory neurotransmitter that may contribute to a positive mood. Along with the amino acid L-theanine‚ the GABA found in Emotional Wellness by Pure Encapsulations may also promote a sense of relaxation by working to enhance alpha wave production. Emotional Wellness also contains L-tyrosine and 5-hydroxytryptophan (5-HTP)‚ which are precursors to neurotransmitters like norepinephrine‚ serotonin‚ dopamine‚ and epinephrine. These neurotransmitters are involved in brain and endocrine activity‚ as well as sleep/wake cycles. 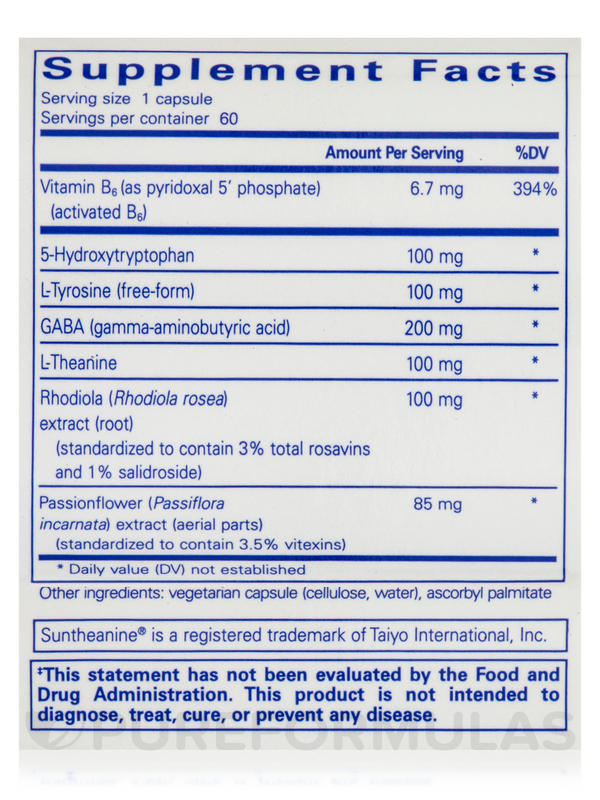 In addition‚ L-tyrosine may work with the Rhodiola rosea herb to help maintain memory and cognitive function during infrequent stressful periods. Passionflower has been used in traditional medicine for its possible calming effects; it’s part of the Emotional Wellness formula because it may potentially alleviate certain symptoms related to mild anxiety. 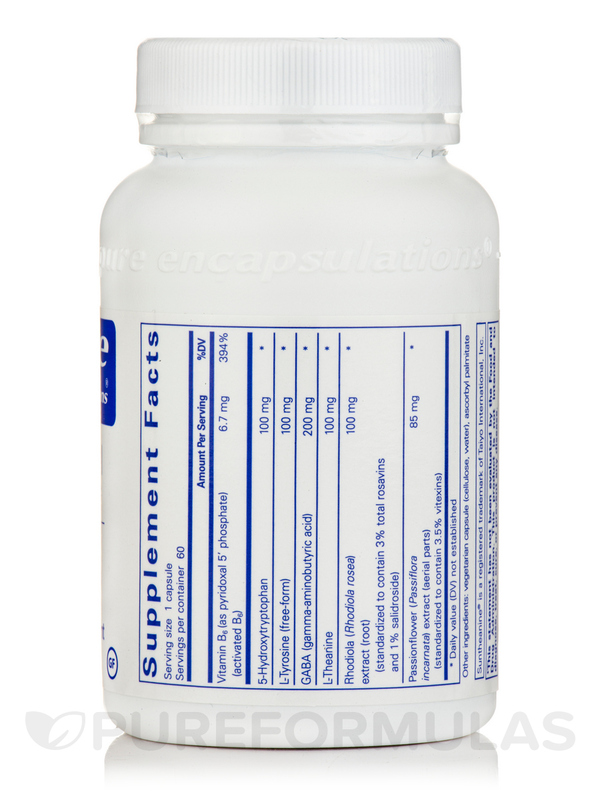 Last but not least‚ the vitamin B6 in this supplement may serve as a cofactor that can further promote emotional well-being. Take one to three capsules daily. 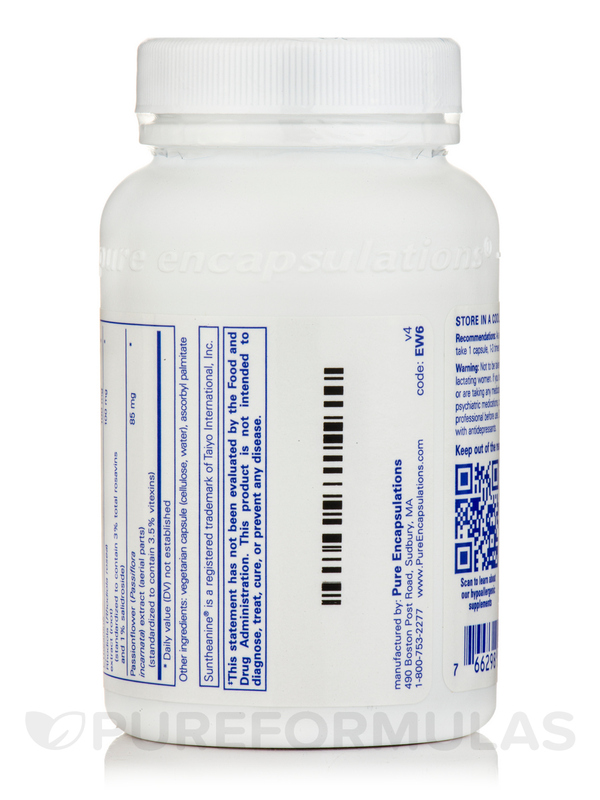 At the recommended dosage‚ each 60-capsule bottle of Pure Encapsulations’ Emotional Wellness should last from 20 days to about two months. 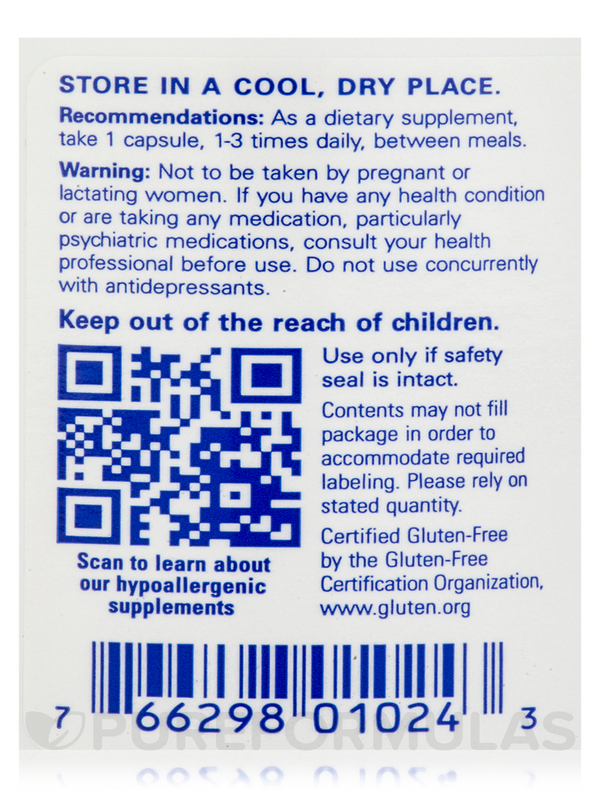 As a dietary supplement‚ take 1-3 capsules daily‚ in divided doses‚ between meals. 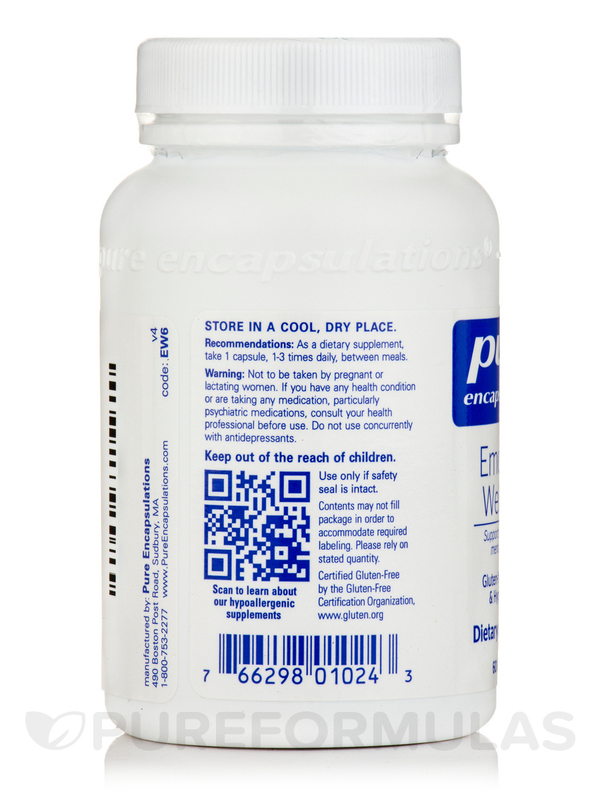 If you have any health condition or are taking any medication‚ consult your health professional before use. Do not use concurrently with SSRI medications or MAO inhibitors. I was taking Emotional Wellness a few years ago to help with chronic migraines and the many challenges that go with them. I believe Emotional Wellness has a calming effect when I take two a day and helps keep my mood more stable when serotonin levels are low. I love how calm i feel everday. 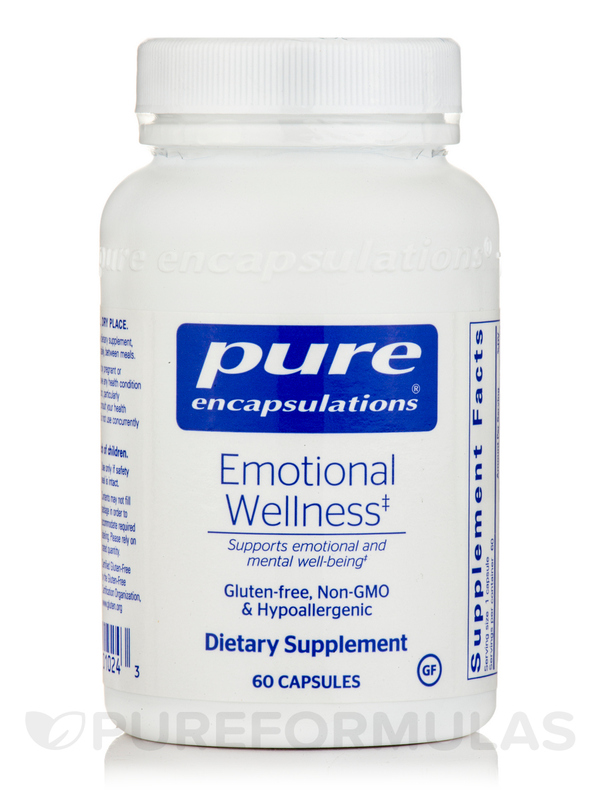 My dr. recommended Emotional Wellness by Pure Encapsulations a few months ago and I felt the calm inside within the same week. I feel more relaxed and less anxious. I love the way it helps me. The Emotional Wellness says take between meals. If it should make you naseaus can you take it with food with out any issues? Hi Dyanne, we do apologize but here at PureFormulas we can only suggest taking this product recommended by the manufacturer. Please speak to your healthcare practitioner to know if taking it any other way would be safe and better for you.